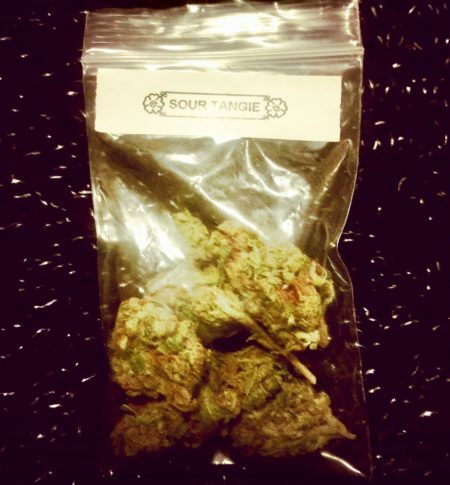 Strain - Sour Tangie - High. How Are You? I got my hands on an eighth of Sour Tangie awhile back and while I am a fan of most strains in the sour family, I’m not of fan of ST. I liked the effects; euphoria, energy, and nice conscious high. I felt very clear with no haze. After smoking, I felt the urge to do things like take a hot shower and stretch. To try and take advantage of the looseness of my muscles and my alert state of being. It has a very strong citrus smell and soft enough to pull apart with my hands. Aside from the high, I didn’t like how much it dried me out. The only way to smoke or vape Sour Tangie and not be extremely uncomfortable is to have a water bottle, lip balm, and eye drops present at all time. I found that hours later I had lost the high, but still felt slightly dehydrated. It’s not the kind of weed I want to smoke and go outside on, which is not helpful for someone like me who is constantly on the go. I had a slight anxiety about being high in public after smoking ST, which is how I usually feel with Indica. I really do think my paranoia with had less with actually being high, and more to do with constantly having to re-apply lip balm and take sips of water. My nervous actions were starting to actually make me feel nervous.